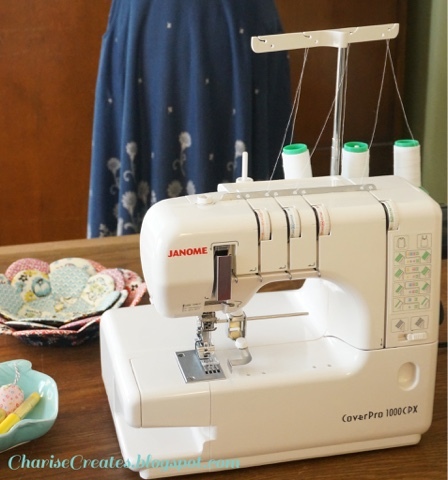 A few months back I purchased a Coverstitch machine from Pink Castle Fabrics ~ the Janome CoverPro 1000CPX. A Coverstitch is a sewing machine that has multiple stitches mainly used for hem finishing on knit garments. 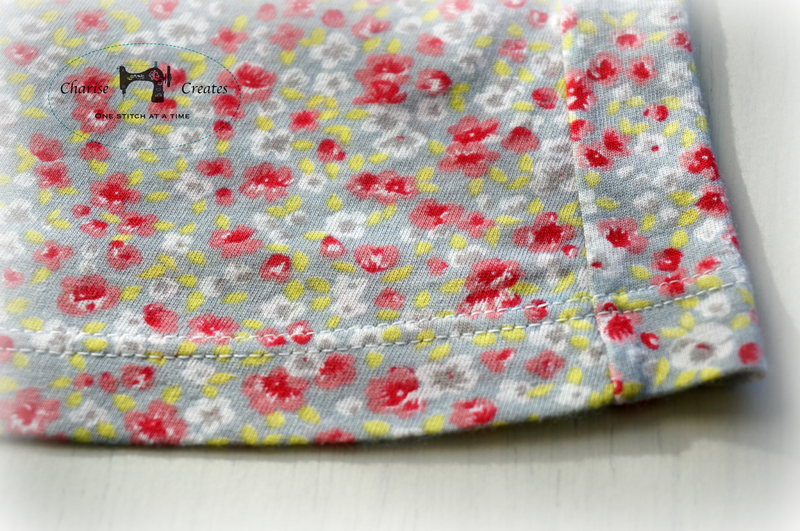 It can be used on Sleeve Hems, Bottom Hems and Necklines. I love to sew knits but I am perennially disappointed with the hems on my garments made with a straight stitch home sewing machine. They look nice but aren't stretch enough for knit fabrics. If you look at a purchased knit garment, you will notice the double or triple needle stitch used to finish hems and sometimes necklines on garments. I decided to try it in a few different applications ,other than hems, which you can see below. I used the double needle coverstitch to stitch down an elastic waistband. The machine can handle multiple layers of fabric. This waistband has five layers of knit fabric plus elastic and it sewed like a dream. 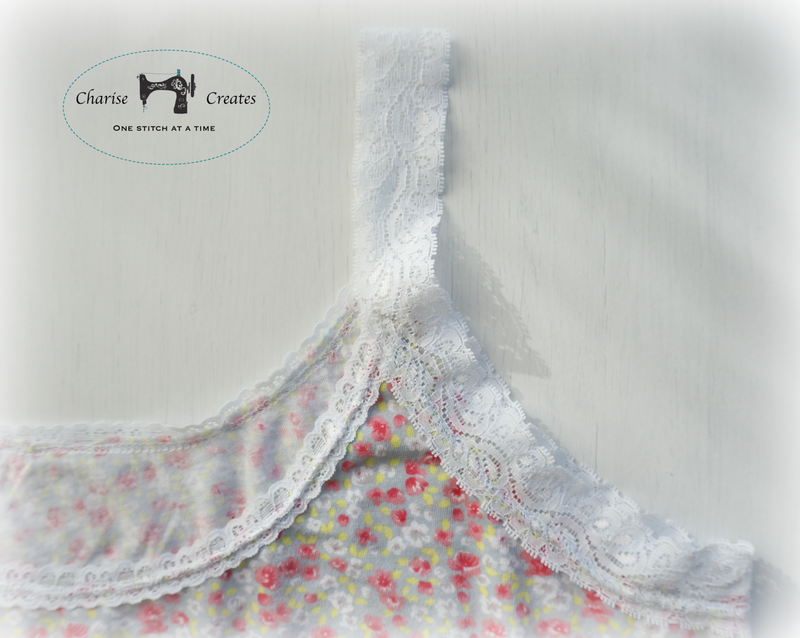 This nightgown has lace that is applied on the top edge using the double needle coverstitch. I love the way it turned out. It is a nice clean finish with plenty of stretch. The machine comes with a presser foot that is solid metal. I had lots of trouble seeing where the needles were stitching. So much, that I did a bit of research for a solution before using the machine again. I found a partially transparent foot (pictured above) that allows you to see where you are stitching. I highly recommend it. It is a bit spendy but worth the extra $. Another great attachment is the Adjustable Seam Guide. The Instruction Manual advises marking the hem width on the right side of the garment. You then stitch on the line. The seam guide can be set to the edge of the fold of the hem so you can skip the marking step. 1. Fold the hem to the wrong side, the desired width. Press in place. 2. Set the seam guide to the edge of the folded hem. 3. With the right side of you garment facing you, stitch your hem. 1) Keep the instruction manual handy. You will need it for machine basics, threading, and tension information. 2) Keep stitch sample for different fabrics and stitches. I hope this review was helpful. If you like to sew knits, I highly recommend this machine to give your garments a professional finish. If you have any specific questions, please leave a comment and I will reply on the blog. This looks perfect for me as I have never wanted a serger they look terrifying! Great review. As an aside - the petal fabric "dishes" behind the machine in your first photo - they are gorgeous! Perhaps you could do a tutorial/pattern to make these?? :) Merry Christmas! Do you still use this Coverpro 1000cpx? I'm thinking of buying one, but now they have the 2000cpx.